From 2-year-olds to 92-year-olds and better, patients of all ages can enjoy bright, healthy smiles. At Vital Dental Care, we are passionate about providing patients with effective and gentle dental care. Kind and compassionate, Dr Philip Chou (Dentist) helps patients feel comfortable in our warm and friendly environment. He grew up with a dislike for going to the dentist so he understands how important it is to ensure that every patient feels at ease throughout each procedure. The idiom “prevention is better than cure” certainly applies to dental care. By coming in twice a year for checkups, you may prevent decay and also avoid more serious dental problems in the future. Your family’s hygiene visits may include a scale and clean and fluoride therapy. Crowns and Bridges: Severely decayed or broken teeth may need to be covered with a porcelain crown or replaced entirely with a bridge. Removable Dentures: Whether you have a few missing teeth or are missing a mouthful, we can give you your smile back. Root Canal Therapy: If the nerve of your tooth becomes infected or damaged, Dr Chou can help you avoid an extraction by performing a root canal. Sleep Apnoea Management: If you or your partner has sleep apnoea, we invite you to see Dr Chou for a consultation. He can fit you with a custom appliance that can allow you to sleep soundly and protect your teeth in the process. White Fillings: Unlike metal fillings, composite restorations are mercury-free and more aesthetically pleasing. They’re ideal for providing minimally invasive restorations when you have tooth decay. Wisdom Tooth Removal: If you have impacted or infected wisdom teeth, book an appointment for a consultation with Dr Chou. He can discuss the extraction procedure with you. As a government-funded allowance, the CDBS covers eligible children who are 2-17 years of age. Qualifying participants are eligible to receive up to $1000 in bulk-billed general and restorative dental services. To determine if your child is eligible, ring us today and simply provide your Medicare number. We can let you know straight away. 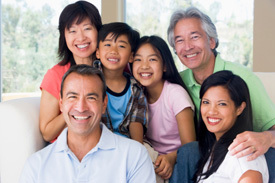 Ensure that you and your family get the dental care you need. Contact us today to schedule an appointment! We are preferred providers for many insurance plans.